Cross-stitched Thread on Aida (art 4in x 4in). This is the first time I've done cross-stitching and it took 8 hours to do this much! UPDATE: You can now download a PDF of the original pattern I designed for this HERE. As always if you use it please send me a picture! Cross stitching does take forever! Just be lucky you got to stick with one colour. Also, over time, it can mess up your eyes. Ask my mom and her giant magnifying glass. Looks great though! Worth it! Fantastic! I love this one. You'd probably rock at a more freeform embroidery style, too. This is great! Cross-stitch is time-consuming, but the end product is worth it! Oh, I like this one a lot. Imagine tea towels or napkins with this design. Yes! And in case you are actually brave enough to try your own cross-stitch project I've just posted my original pattern for download! I guess that answers my first question: whether you plotted the design before stitching. Noah! You really are a crafty one, I'm impressed. 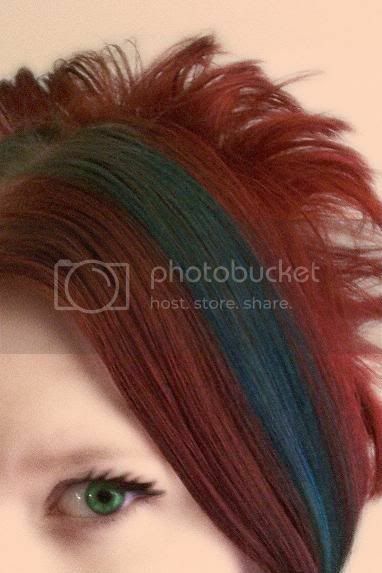 I will definitely do this little number (eventually). I might try it with white thread on black aida or linen. Thanks for this pattern! 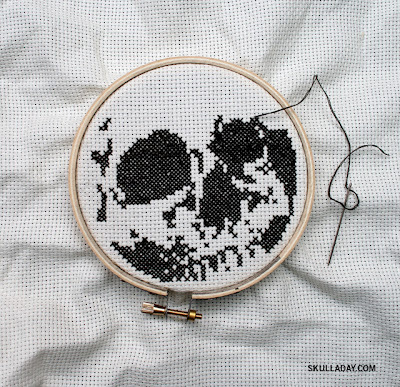 I am excited to report that I have begun my cross-stitch skull! If you'd like to check out my work in progress, I've posted it here. I've never successfully completed a cross-stitch project before -- I'll be sure to let you know if/when I finish this one. 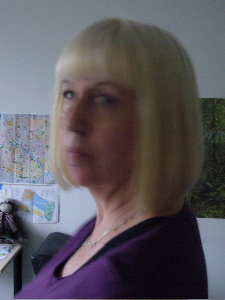 Great blog -- thanks for the daily inspiration! I used your pattern, thank you for this great skull! i love cross stitching, i cant wait to start stitching this! I just got my first cross stitch kit this weekend! I'm REALLY looking forward to rocking this skull!! Thanks so much for the pattern. I'm gonna love stitching this and my kids are gonna love getting it for Christmas. Excellent design. I'll send a pic when I finish. Not sure if you can see that, but it's a skull with a dragon wrapped around it. I have about say 50 hours in it so far. thanks for this awesome pattern!